Bill is in Portland at Quilt Market and I decided to invite one of Sophie’s friends over for a special Saturday Girls’ Night dinner out and a sleepover. While the girls were playing cards and racing around the house having fun, I thought about Kathreen and Rob and their kids. In the midst of sadness I always turn to making because making is inherently optimistic. I had never canned any chutney so I decided that this would be the perfect time. Bill teases me that having a pantry of jars of things I’ve made is very comforting to me. Not that in an emergency I’m going to live off of chutney but it’s nice to have homemade gifts ready to go and something special in the house for unplanned visitors. I used Alton Brown’s Mango Chutney recipe. Disregard the prep time as the chopping and measuring was time consuming but worth it. At least where we live, finding 5 mangoes all ripe at the same time is unlikely so I bought equally unripe ones a week ago and waited for them all to ripen. For the portion that I planned to can, I shaved 10 mins off the cooking time as that was the time that would be needed in the water bath to seal the lids. The portion I planned to use immediately I continued to cook for the recommended time. That strategy worked well. 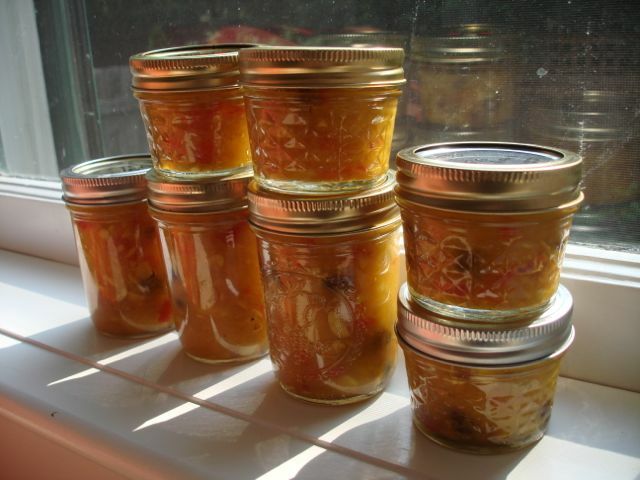 For condiments like chutney and pickled onions and such, I use a combination of 4 oz and 8 oz jars and give smaller jars to smaller households. The recipe made more than is shown here and more than the recipe suggests (which is why it’s ideal for canning) but the rest was given to friends or refrigerated. One warning: don’t make this recipe if you ever want to enjoy store-bought chutney again. Store-bought chutneys are much heavier on the sweetness while this is wonderfully fruity and flavorful. In addition to eating chutney with Indian food which we cook frequently at our house, I also love it as an appetizer with cream cheese and crackers. We rarely have time to go to movies but have been glad to have made the time to see two inspiring movies that are in theaters now. The first is an indie film that you may have a hard time finding if you don’t live in a major city but is worth renting when it is eventually available on Netflix or elsewhere. If you can see it in the theater, though, it’s well worth the price of admission. 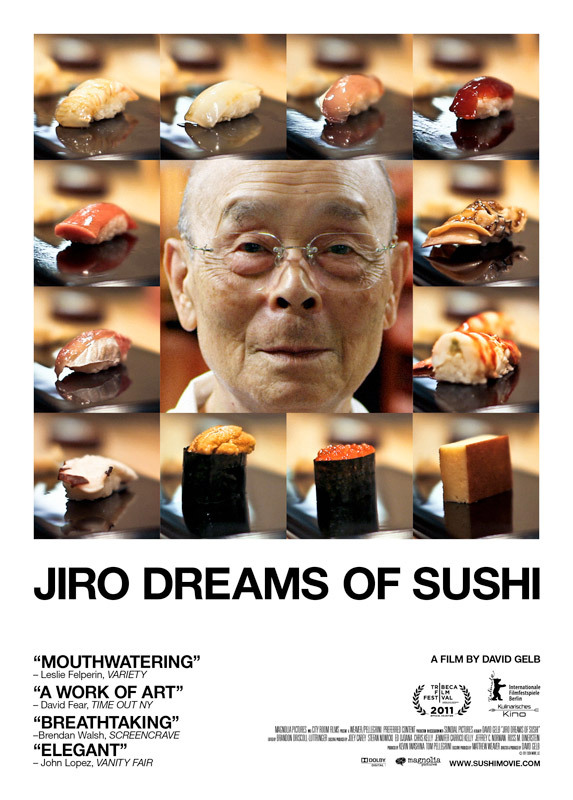 It’s called Jiro Dreams of Sushi but sushi isn’t really the point of this movie in my opinion. More on that later. The movie focuses on Jiro, a 93-year-old sushi master who operates a 10-seat sushi restaurant in a Tokyo train station. Jiro has two sons who are trying to live up to their father’s international reputation. Jiro has been named a National Living Treasure in Japan and his restaurant has awarded the coveted three-star rating by Michelin. Some people might say that this movie is about perfection. I’d disagree. I think it’s about being excited about your work and the meaning of work in one’s life. You can’t watch the movie and not think that Jiro’s love of making sushi contributes to his well-being and physical health at 93. There’s also a more subtle theme in the movie that resonated with me about how hard it can be to resist comparisons to others. Jiro’s son’s can’t escape comparisons with their father and you can tell that they just wish they could have their work stand on its own. I find myself forced to be aware of the rankings and ratings of our books on Amazon vs. that of others, how many Facebook “like” we have compared to others, blog stats, and sales goals, etc. Like Jiro’s sons, I wish our work could be judged on its own and not in comparison to that of others. And I wish that they didn’t sting as much as they do. Jiro Dreams of Sushi is a beautiful movie as well. It’s a soft-spoken film that whispers inspiration about the importance of craft and of taking the time to do things well. The other movie that has earned your entertainment dollars and is worth seeing on the big screen is Mirror, Mirror. This retelling of Snow White has a charming story but if you’re a creative type the biggest reason to go is Eiko Ishioka. Eiko Ishioka was an iconic costume designer who, prior to her death in January won Academy, Grammy, and Tony awards, among others, for her work. These stunning costumes are her parting gift to us. They will make your jaw drop. They are both so exquisitely made and unlike anything else I’ve ever seen. The colors, the concepts, the fabrics, the silhouettes, the details, the staging. I can’t stop thinking about those beautiful costumes and I wanted to run to the nearest sketchbook and design a new fabric line based entirely on the Ishioka’s costumes. Many of you know that I spent my 20s in Japan and that experience was deeply formative for me. So I quickly note that both Jiro the sushi maker and Eiko the costume designer have a few things in common. They both lived through World War II in Japan and likely had limited opportunities in the prime of their lives in post-World War II Japan. They both toiled on perfecting their craft, paying attention to the details, doing great work and continuously setting the bar higher and higher for themselves. Undoubtedly they spent a lot of years working hard before they achieved greatness. That ability to focus and continuously challenge yourself without getting discouraged is as inspiring to me as their work.